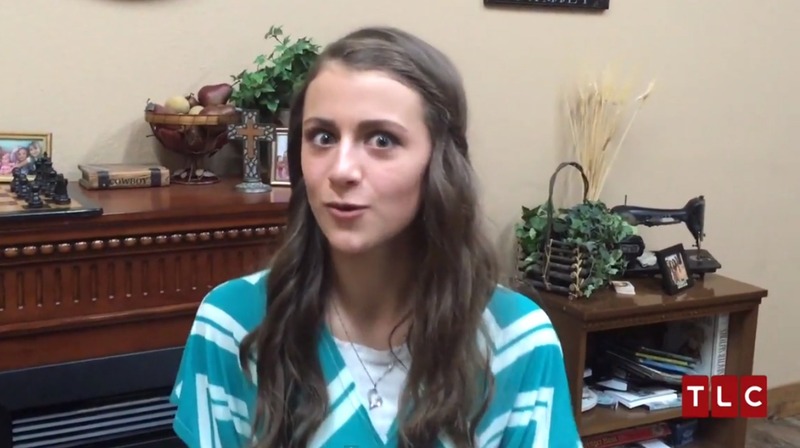 At least Josiah Duggar’s new girlfriend clearly won’t mind the cameras that follow her new beau’s family. News broke of the most recent Duggar courtship last week, but now there’s an official announcement video, starring the extremely eager Marjorie Jackson. But who could possibly be courting? Don’t worry, Duggar fans. Marjorie is super excited to let you know. Of course she did: Josiah, who bounds into the frame as Marjorie announces that he’s the lucky, marriage-seeking Duggar. Marjorie interrupts, “What do you know? !” before looking intently and longingly at Josiah as he explains courtship — “dating with a purpose,” as the staunchly religious Duggars say. To say that Marjorie is a little intense would be an understatement. And sure, she’s 17 so she’s probably just excited about having a new boyfriend. But her overeager video certainly makes her look excited about something else: being on TV. By courting a Duggar, Marjorie is basically ensuring she’ll appear on the family’s TLC reality series, 19 Kids and Counting, and based on this announcement video, we can’t help but wonder if she’s excited more about getting to know Josiah or working on her already-apparent acting chops. Check out the video announcement — starring Marjorie Jackson — below and then head to the comments and tell us whether you agree with our take.